This granulated dashi soup stock makes use of the flavors of three main ingredients: kombu seaweed, katsuo (oceanic bonito), and niboshi (small dried sardines). Simply dissolve in water to use as broth or seasoning. Each package is 80g total (20 bags, 4g each). An elegant dashi soup stock that evenly balances the flavors of kombu seaweed with its seafood ingredients. This product is granulated and easy to use. It can be used for miso soup, suimono (clear broth soup), hot pot, and stews; and can also be used to accent vinegared or pickled dishes (sunomono), or chopped foods with sauce (aemono). Information on similar products: In other commercially available Japanese-style dashi soup stocks, a lot of chemical seasonings (monosodium glutamate, inosinic acid) are used. They also use hydrolyzed protein. Sugarlady’s Japanese-style dashi soup stock and other seasoning products are safe and free of chemical seasonings and additives, letting the true, natural flavors of the ingredients themselves shine – and allowing you to enjoy your meal without worry. Seasonings can be a crucial part of a meal, turning plain food into a delicious experience. After all, sometimes we only think we don’t like certain foods because we haven’t tried them with the right seasoning! 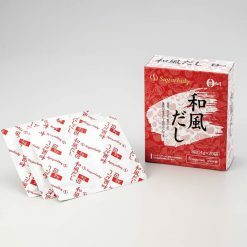 To make dashi soup stock for miso soup, suimono, stews, hot pot, or other Japanese-style dishes, dissolve 1 bag (4g) in approximately 600ml of water. 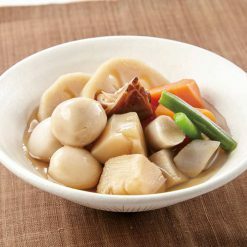 To use the dashi soup stock broth as an accent for other foods such as sunomono, aemono, or tare sauces, use just as much as you need to create a mildly flavored finish. Feel free to adjust quantities to your tastes. This product contains dextrin, yeast extract, flavor ingredients (kombu seaweed extract powder, niboshi (small dried sardines) extract powder, katsuo (oceanic bonito) extract powder), sugar, table salt, potato starch, fermented seasoning..